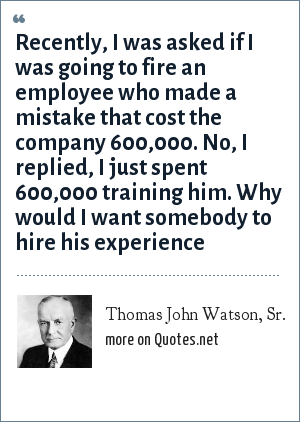 Thomas John Watson Sr. was an American businessman. He served as the chairman and CEO of International Business Machines He oversaw the company's growth into an international force from 1914 to 1956. "Thomas John Watson, Sr. Quotes." Quotes.net. STANDS4 LLC, 2019. Web. 25 Apr. 2019. <https://www.quotes.net/quote/18766>.